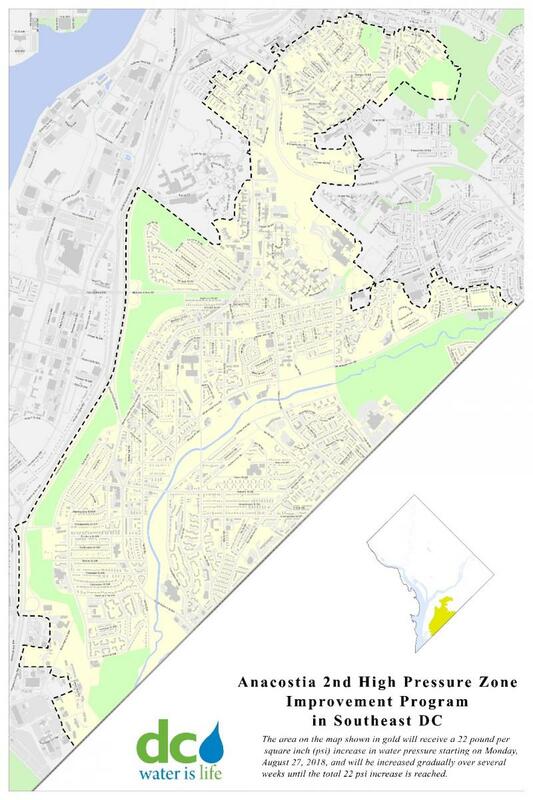 DC Water has completed its Pressure Zone Improvement Program (PZIP) for the Anacostia 2nd High Service Area. The planned increase in water pressure for more than 6,000 Ward 8 homes and businesses began on Monday, August 27, 2018 and ended on Tuesday, September 25, 2018. In recent years, the community has expressed concern regarding low water pressure in southeast DC. To address these concerns, DC Water constructed the Anacostia Pumping Station, installed water mains, and built a two-million-gallon water storage tower on St. Elizabeths campus. The completion of the tower is the last in the series of projects that will result in the formation of the new pressure zone. This new infrastructure will produce an increase in water pressure of 22 pounds per square inch (psi) across the service area. The benefits of this project include not only improved water pressure, but also increased fire protection for all customers across the service area. Following implementation of the pressure increase, some homes and businesses may experience water pressure exceeding 80 psi, which is regarded as high water pressure. Per the District of Columbia Plumbing Code, all buildings with high water pressure are required to have a pressure reducing valve (PRV) installed. If your single-family residential home was identified as one that will experience pressure higher than 80 psi as a result of the 22 psi increase and you have not yet had a PRV installed, you can still submit your Agreement, and we will call you to schedule a PRV installation appointment. If you own or manage a multi-unit building that will experience water pressure higher than 80 psi, we recommend that you consult a DC-licensed plumber to install a PRV. For all customers whose homes will experience an increase in water pressure, DC Water recommends that you take steps to prepare your home for the upcoming pressure increase. Please ensure that your household plumbing is in proper working order. One way to do this is by checking all plumbing fixtures to ensure they are tightened. This general information is being provided as a cautionary measure, as the introduction of increased water pressure to any home plumbing system could possibly result in some leakage from pipes and faucets that are not in good condition or tightened securely. Should you have additional questions or require assistance in checking your plumbing system, DC Water suggests that you consult a licensed plumber. Should you experience discolored water or any other water quality issue, please call our Drinking Water Division at 202-612-3440 or click here for more information. If you have any questions about the project, call DC Water at (202) 787‑4065 (weekdays, from 8:00 am to 4:00 pm) or send an email to pzip2ndhigh@dcwater.com. The commissioning of the St. Elizabeths water tower will result in a 22 psi water pressure increase to more than 6,000 properties across the Anacostia 2nd High Water Service Area. The water pressure increase is scheduled to begin on Monday, August 27, 2018, and will continue gradually over several weeks until the 22 psi increase is reached. All customers within the heavy dotted area shown on the project map will experience the pressure increase. Some of the properties will experience water pressure greater than 80 psi. When water pressures are equal to or greater than 80 psi, more commonly referred to as high water pressure, the DC Plumbing Code requires the installation of a Pressure Reducing Valve (PRV). DC Water also provided general information to all customers who will be impacted by the water pressure increase. Is my property within the PZIP Area?